The elder son of of Carus, Carinus was given the rank of Caesar soon after his father's accession. When his father set out the Eastern frontier near 283, Carinus was left to Rome to look after the government of the Western provinces. Obverse: CARVS ET CARINVS AVGG, Jugate busts radiate and cuirassed right (Carinus sometimes bare-headed). Reverse: PAX AVG, Pax standing left, holding olive-branch and sceptre, B in left field. 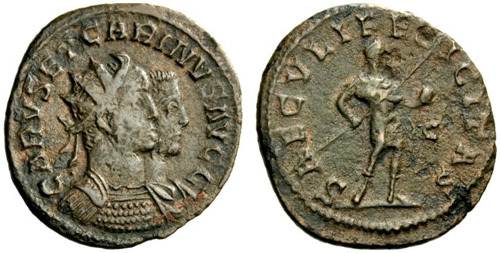 Obverse: CARVS ET CARINVS AVGG, Jugate busts right of Carus, radiate and cuirassed and Carinus, bare-headed and draped. Reverse: SAECVLI FELICITAS, Carus standing right, holding spear and globe; in right field, C.
Reverse: VICTORIA AVGG, Victory walking left, holding wreath and palm, A in left field.